Bridge over Ellore [Eluru] Canal near Bezwada, Kistna. bl.uk > Online Gallery Home	> Online exhibitions	> Asia, Pacific and Africa Collections	> Bridge over Ellore [Eluru] Canal near Bezwada, Kistna. 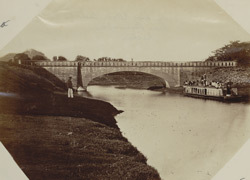 Photograph from the Crofton Collection: 'Public works including the Manora Breakwater and the River Son canal system', taken by Ross Thompson in 1863. The Krishna (Kistna) river rises in the Western Ghats in Maharashtra, and flows SE through Karnataka and Andhra Pradesh to the Bay of Bengal. One of the earliest irrigation projects on this river was the Krishna Canal project. Bezwada, a small town on the left bank of the river Krishna, at the head of its delta was the headquarters of the Krishna canal system. The anicut or dam at Bezwada, begun in 1852, consisted of a mass of rubble, fronted with masonry. Of the two main canals connected with the dam, that on the left bank broke into two branches, one running 39 m. to Ellore, the other 49 m. to Masulipatam. The canal on the right bank proceeded nearly parallel to the river, and also sent two principal branches, to Nizampatam and Comamur. The canal irrigated more than 500,000 acres, and also provided navigation throughout the Krishna delta.